Control the humidity: 20% -60% RH 10% -20% RH 1% -10% RH..
Humidity Sensor: American original brand honeywell error is less than ± 2% RH precision humidity sensor. Modular design , high precision and high stability. Temperature and humidity control and display : precision LED digital temperature display full-screen display :. -9 ℃ ~ 99 ℃, accuracy ± 1 ℃. Humidity Display : 0% ~ 99% R. Accuracy ± 3% RH. Display accuracy and stability, long service life. Dehumidification Host : use technology cooperation with Japan , preclude the use of hygroscopic materials imported polymer and China's patent . The shell is made of imported high-temperature plastic particles repression. Durable without deformation. Cabinet structure : cabinet material : 1.0mm high quality steel enclosure with several automatic punch presses and CNC sheet metal equipment high production, manufacturing precision , good airtight enclosure . Bian cabinet surface coating with imported resins, automatic powder coating line . Good quality and appearance . 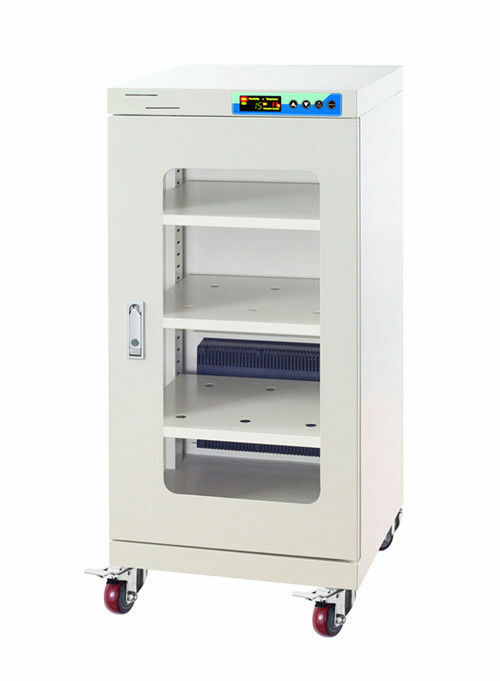 Bottom of the cabinet is installed 360 ˚ rotation with brake casters for easy mobility and fixed . Door windows : window frames crimping 5.0mm high-strength tempered glass door handle using planar integrated handle the pressure of high-strength lock with anti-theft feature . Load Laminates : Laminates used to strengthen the structure design , high strength material contained , uniform load up to 100kg load bearing force , the height gap can be adjusted according to the height to put items . Make it easier for storage . Space utilization higher. Dehumidification principle: Electronic Cabinets dehumidification host using environmentally friendly absorbent polymer material , the use of shape memory alloy systems dehumidification method , a unique patented technology, with intelligent microcomputer program control system simply set the desired humidity control device automatically after work . . host shell is made of high-temperature flame-retardant materials , to prevent the occurrence of safety hazards. Automatic moisture off the design , you can still use chemical absorbent bit features to dampness, humidity rises within 24 hours does not exceed 10 %. No damp , no heat, no dripping . Energy saving, long life . ◆ How it works: dehumidification host the door open, the outer door closed , environmentally friendly polymer materials absorb moisture vapor within the Electronic Cabinets , the door is closed, the outer door opened, absorbent material heater , so the moisture evaporates into the Cabinets , the shape of the and internal memory alloy spring responsible for external doors open and close . above steps under program control system intelligent microcomputer control loop , gradually reduce the humidity in the Cabinets . As monolithic , LSI LSI, VLSI VLSI, Bipolar, MDS, CCD, MCM, DIP, SOP, SSOP, TSOP, VSOP, SDIP, SIP, SOJ, SVP, QFJ, CSP, KGD, PGA, QFP, TCP, LCA and BGA packaging.